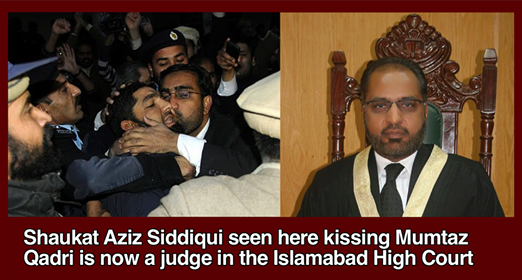 UPDATE: The photo below has been reported to incorrectly identify Justice Shaukhat Aziz Siddiqui as the man kissing Mumtaz Qadri. According to report in DAWN, the man kissing Mumtaz Qadri is actually Advocate Yasir Shakeel. A lookalike of IHC Justice Shaukat Aziz Siddiqui. Hazrat Ali (RA) famously stated that even a state based on kufr can survive, but a state based in injustice is doomed to fail. Recently we are seeing worrying signs that Pakistan is becoming a state of injustice. The most troubling of these, however, occurred only recently as Shaukat Aziz Siddiqui was appointed to Islamabad High Court. Shaukat Aziz Siddiqui is an extremist ideologue who is out of touch with the Pakistani mainstream. In 2002 elections, he was awarded a ticket by extremist political party created by the ISI Muttahida Majlis–e–Amal whose leaders include Taliban supporters Samiul Haq and Munawar Hassan. Even then he was loudly rejected by the people receiving only 12,000 votes in NA-54. In 2011, Shaukat Aziz Siddiqui openly celebrated the self-confessed murderer Mumtaz Qadri and was photographed kissing the killer in the streets. Let us not forget that Mumtaz Qadri confessed to the cold blooded murder of Salmaan Taseer, was convicted by the court, and sentenced to death as a cold blooded killer. Now the people are expected to walk into the Islamabad High Court and still believe that it is a place where the rule of law is respected? There is a solution to this crisis. Article 209 of the Constitution allows Judges of a High Court to be removed if he is ‘incapable of performing the duties of his office or has been guilty of misconduct’. Shaukat Aziz Siddiqui’s misconduct is his public support for a self-confessed murderer, an act which makes him incapable of performing the duties of his office which includes in its oath the sworn duty to ‘in all circumstances…do right to all manner of people, according to law, without fear or favor, affection or ill-will’. Through his public actions, Shaukat Aziz Siddiqui has proven himself incapable of performing the duties of a High Court Judge and should be removed from office immediately. Only then can we have faith that the Courts are actually Halls of Justice. This entry was posted in Blogs and tagged constitution, judiciary, Mumtaz Qadri, rule of law, Salmaan Taseer, Shaukat Aziz Siddiqui by Sidra Jafri. Bookmark the permalink. i did not know his backgroud, but Siddiqui did not voilate any thing. he is a real muslim, the liberal people mostly dislike such person. this is the just difference of liberal and muslim thinking. Siddiqui is the hero of Muslim ummah… l solute his courage and love for Islam. . Horrified to see the majority of comments. Pakistan is sinking deep into intolerance, bigotry and hatred. The biggest enemy of Islam is ignorance – deeply rooted into our society.